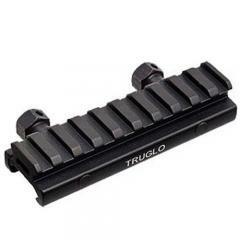 TruGlo's Picatinny-style Riser Mount raises an existing mounting surface by half an inch. This allows shooters to place a scope higher in order to clear other sights and creates greater comfort and ease of use. The mount fits standard AR15 flattops and attaches securely to a Picatinny rail without the need for modifications or specialized tools. Once in place, it remains securely mounted. The CNC-machined aluminum body and high-quality coated screws ensure lasting service life. The riser measures approximately four inches long, providing plenty of room for additional compatible accessories.